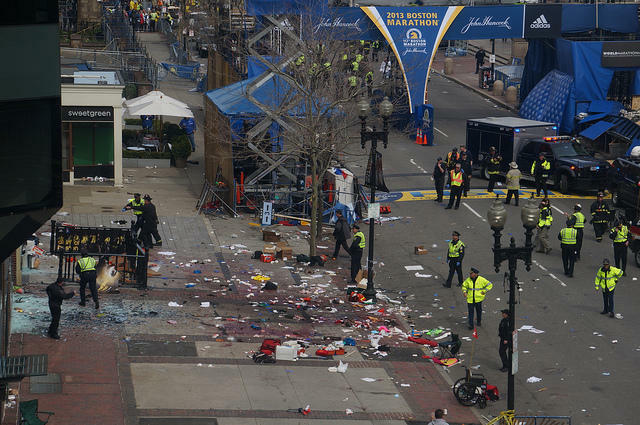 Aftermath of the Boston Marathon bombings. Runners in the Triangle will be jogging through Raleigh this weekend to support victims of the Boston Marathon bombings. Organizers will be taking donations for the families of those who died or were injured in Monday's explosions. Kazem Yahyapour is the director of Cary's annual Tobacco Road Marathon and organized this Sunday's benefit. He finished the Boston Marathon minutes before the bombs went off. "Immediately, we heard a huge explosion. My wife said, 'I think it's a bomb.' I said, 'You're kidding me,'" says Yahyapour. "Within 10 seconds, we heard another bomb. People started running and saying, 'Bomb! Bomb! Everybody take to shelter.' It was totally chaos. Nobody knows what's going on. Everybody was just worried that there was going to be another bomb." The explosions killed three people and injured more than 170. "I came home Monday night and I couldn't sleep," Yahyapour explains. He says many runners train for years or decades to qualify for the Boston Marathon. "I thought about it and I'd like to see if I can get some people helping me put this run together for a couple of reasons; one, we want to show the whole world that, as runners, we are resilient. We are not going to give up. We're going to continue running. Second is if there's any way we can help the victims with any fundraising we can." Yahyapour expects more than 200 people to turn out at this weekend's three-mile race. It starts at Moore Square in downtown Raleigh on Sunday afternoon. Yahyapour urges runners who have completed the Boston Marathon to wear their blue and gold t-shirts.